A major NSW regional council has introduced a supernatant recycling system into the filtration plant in the town water supply, helping to conserve potable water and providing substantial water savings over the long term. The Bathurst Regional Council recycle system, installed by Ted Wilson & Sons of Blayney using equipment supplied by CST Wastewater Solutions, recovers and disinfects the filter backwash water at the plant. Disinfection of backwash supernatant – clear liquid that collects above sediment – is not widely used in Australia, but can recover up to 10 per cent of raw water supply while also avoiding the need for discharge flows into river systems. Serving a population of about 37,000, Bathurst’s water filtration plant was originally constructed in 1972. Significant upgrades from 1987 to 1994 increased the water treatment capacity from 27 to 60 million litres per day. The filter backwash water, which is a byproduct of the reverse flushing of the sand filters in the filtration plant in order to clear them of sludge, is discharged into the system’s three sludge lagoons, along with sludge from the sedimentation tank. Previously the supernatant from the sludge lagoons was eventually decanted from the lagoons and discharged. The new system involved the construction of a supernatant pumping station and associated pipework to enable the automatic recycling of supernatant from the sludge lagoons into an in-ground well, and then into the first chamber of the rapid mix tank. The recycle stream will not exceed 10 per cent of the raw water flow through the water treatment system. At the present annual water consumption of about 6000 ML, the wastewater to be recovered could be in the order of 192 ML per year. The overall water to be saved is estimated to be 13,000 ML over 50 years. These estimates are based upon average seasonal demand patterns. With the unseasonal summer just past (2011/12), demand has been lower than expected and the water filtration plant has not operated at full capacity. The supernatant currently being recycled is 6 per cent of the plant flow. This will vary with demand into the future. Contractor TWS was required to supply and install two submersible motor pumps for the pumping station at the in-ground well, one being a duty pump and the other a standby. Also installed were an electrical switchboard at the pumping well and other associated equipment, including a level control for the pumps and lifting chains for raising and lowering them for maintenance. 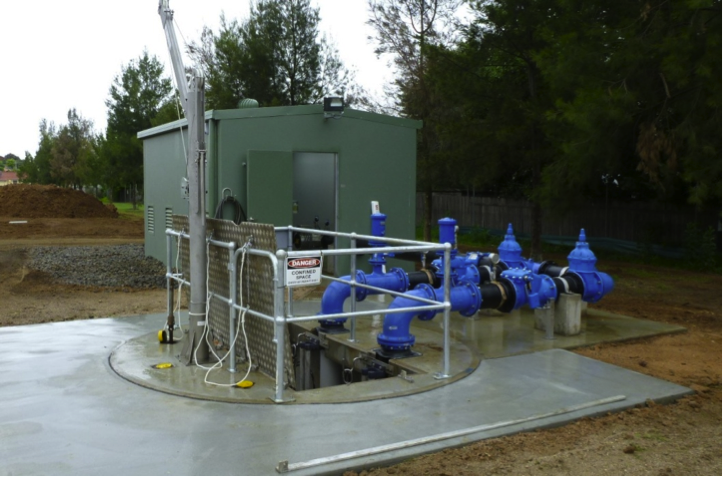 A Berson UV disinfection system, supplied by CST Wastewater Solutions, was fitted between the pumping station and the rapid mix tank to disinfect the recycled water from the sludge lagoons before returning it to the rapid mix tank. The system fully disinfects up to a flow rate of 60 L/s and has a variable power control to enable the UV dosage to be adjustable to suit operating conditions. The transmissivity (UVT10) of the UV system is 75 per cent, the TSS is less than 10 mg/L and the performance is Log Reductions: >3.1 Log Faecal Coliforms, >2.0 Log E. Coli, thereby providing very effective protozoa destruction. Four new-generation Summit medium-pressure high output/efficiency lamps, 2.5 kW per lamp. Autowipe included. Stepless Energy Control (SEC) with variable power matched to the water quality and flow rate. This real time power level control maintains the preset UV dose rate. Turndown is in the 35-100 per cent range, maximising power utilisation. “It’s an interesting project because backwash supernatant disinfection is not widely used in Australia,” said Michael Bambridge, Managing Director of CST Wastewater Solutions. “The advantage is that the method recovers up to 10 per cent of the raw supply, which reduces the demand on the water storage system and avoids the need for waste flows into the river system. Mr Bambridge said that the new generation Berson SUMMIT lamps have a higher output power than earlier lamps and also, with SEC power control, a longer life – up to 12,000 hours instead of 10,000 hours or even less with the old-type stepped power. Rex Wilson of TWS said, “We chose CST Wastewater Solutions to supply the UV disinfection equipment because we had worked together on previous projects. All went well, as with other work we have done with them. The equipment had been wet-tested by the manufacturer Berson before it left the factory in Europe.